Special agents with Homeland Security Investigations, the investigative arm of U.S. Immigration and Customs Enforcement, lead a man away from Fresh Mark in Salem, Ohio, on Tuesday, June 18, 2018, the second such large-scale raid that month in the state. Before we start imagining the possibility of busloads of undocumented immigrants being bused from the nation's southern border and dumped on to Fountain Square because Cincinnati is a "sanctuary city," let's consider one thing. Cincinnati is, in the eyes of the federal government, no such thing. You see, we can call ourselves The Lost City of Atlantis, but saying it doesn't make it so. This has become a matter of concern for some people as President Trump continues to kick around his idea of loading thousands of migrants gathering at the nation's southern border on buses and sending them to the cities and counties which are "sanctuary cities." In Cincinnati, much of the population would welcome the migrants with open arms. But, chances are, they won't have a chance to. Cincinnati's situation revolves around the somewhat hazy definition of what a sanctuary city is or is not. "We are sort of the opposite of a sanctuary city,'' said Christopher M. Pogue, a Cincinnati lawyer who represents immigrants. "We do cooperate with the federal authorities. A true sanctuary city does not." Even Trump's Justice Department has said that Cincinnati is not a sanctuary city. Cincinnati did not wind up on a list of sanctuary cities drawn up by former Attorney General Jeff Sessions in March 2017. Those cities and counties, Sessions said in his memo, were in danger of losing Department of Justice and Department of Homeland Security grants. More recently, Cincinnati was left off a list of sanctuary cities issued recently by the conservative think tank the Center for Immigration Studies. Franklin County, Ohio – home of Columbus – is on the list, which means that if Trump does indeed start parceling out migrants to sanctuary cities, the buses can pass right through Cincinnati and keep going up Interstate 71 to Columbus. 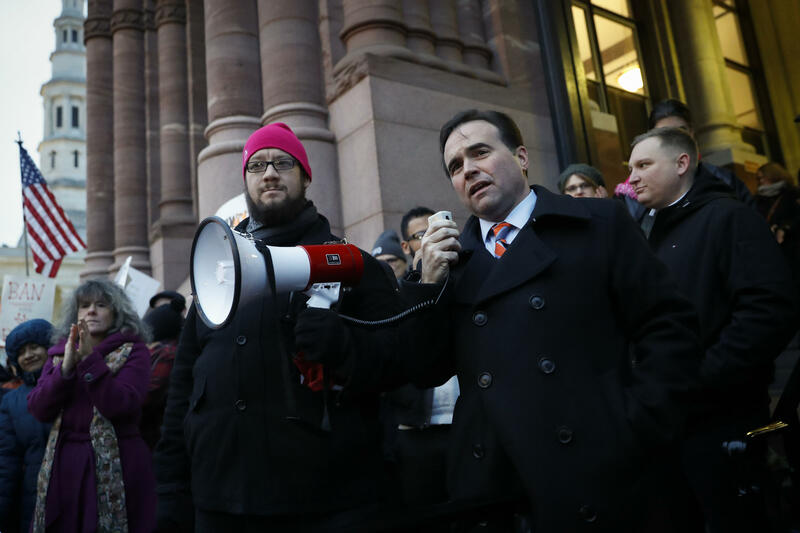 Cranley speaks to demonstrators outside City Hall protesting President Trump's executive order banning immigrants from seven Muslim-majority countries from the U.S. on Monday, Jan. 30, 2017. Earlier in the day, he declared Cincinnati a "sanctuary city." Local law enforcement agencies have no authority to enforce federal immigration laws. That's why there is a federal Immigrations and Customs Enforcement agency (ICE), whose business it is to round up unauthorized immigrants and argue in court that they should be sent back where they came from. The situation is quite different with the county sheriff, who, in the case of Hamilton County, is Jim Neil. The city of Cincinnati has no jail, so if they arrest a person who may be an undocumented immigrant on a serious charge – OVI, theft, drug dealing, etc. – Cincinnati sends them to the Hamilton County Justice Center where they are put in a cell until arraignment. Neil has said deputies continue to detain undocumented inmates at the request of ICE. ICE finds out about them because, when they are booked into jail, their names go into a nationwide FBI data base, and you can bet your bottom dollar that ICE is watching that data base constantly. That's where the concept of an "ICE hold" comes in. ICE can, and does, ask the jailers to hold on to an inmate believed to be an undocumented immigrant charged with a serious crime for a period of time – usually 48 hours – until ICE agents can arrive. That constitutes cooperating with federal immigration officials. A city or county which does that can't claim to be a sanctuary city. "That's why what Mayor Cranley said two years ago about this being a sanctuary city seemed more like mayoral rhetoric to me,'' Pogue said. David Daughtery, a spokesman for Sheriff Neil, says the sheriff's office is still operating under a "General Order on Foreign Nationals," which says that it "shall not detain foreign nationals under an immigration detainer for a minor misdemeanor offense along or where Ohio law would otherwise require them to be released from custody." But, generally, the inmates ICE goes after are the ones charged or convicted of more serious crimes. Pogue said a number of southwest Ohio counties have contracts with Butler County Sheriff Richard K. Jones, who has made a national reputation as a foe of people who have entered the country illegally, to rent beds in the Butler County jail for the suspected undocumented immigrants until their cases can be heard in court. Cincinnati and Hamilton County, Pogue said, can't possibly be sanctuary cities because of the existence of "ICE holds." "We are following the law here,'' Pogue said. "Cincinnati does a lot of nice things for immigrants; it is a very welcoming city,'' Pogue said. "But one thing it is not is a sanctuary city."